The Church of Scientology is launching a standalone over-the-top streaming video channel, The Scientology Network. “It's TIME for us to tell OUR story,” a social account for the network tweeted Sunday. 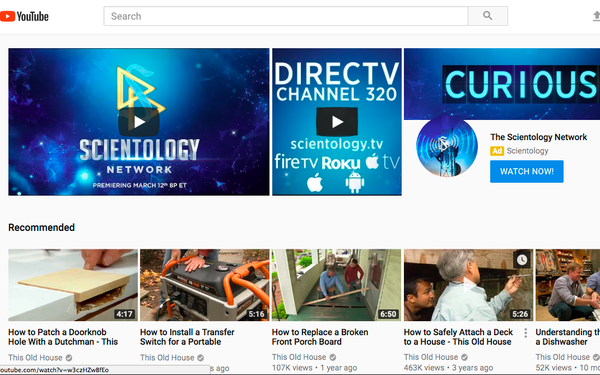 In a sign of just how seriously the controversial church is investing in the network, it bought out the advertising space on YouTube's homepage -- dubbed the YouTube Masthead -- to promote the project. YouTube reportedly charges a minimum of $300,000-$400,000 for 24 hours of its masthead ad placement. The network will go live Monday evening on the Scientology website, as well as through apps on Apple TV, Roku, Chromecast, and FireTV. It will also be available on DirecTV channel 320. According to the description for the channel, programming will include a series called “Meet a Scientologist,” “L. Ron Hubbard: In His Own Voice,” and original films. The church has long been embroiled in controversy over the treatment of former members and has been the subject of numerous films, including “Going Clear,” the film by Alex Gibney that drew critical acclaim when it debuted in 2015. The church, which counts some Hollywood heavyweights as members, has long embraced the media as a means of disseminating its message. It buys regional advertising each year during the Super Bowl, for example, targeting major cities like New York and Los Angeles. 1 comment about "Church Of Scientology Launching OTT TV Network". Tom Siebert from BENEVOLENT PROPAGANDA, March 14, 2018 at 2:12 p.m.